Depending which old wife you care to believe, you loose between 50% and 90% of your body heat through your head … no you don’t. Body heat is lost largely through radiation, so its loss is proportionate to area, can you imagine how big your head would need to be to radiate 90% of your lost body heat? Although you don’t lose quite as much precious heat through your noggin as some people imagine, you certainly loose some and just like any other part of your body, it requires insulating. Wearing a hat (or maybe pulling your hood up) is the usual course of action and when Jack Frost’s sharpened his teeth, what better hat than one containing the best insulator known to man , the undisputed king of warm – down. I’m very fortunate to own two hats insulated with down. The first is handmade, filled with the finest down any amount of money can buy. The outer material is ultralight, the stitching show quality, it weighs virtually nothing and cost considerably more …. and I’ll admit, at times I’m scared to use it. My other down hat is this one. The down may not be of the same quality, it’s produced in a factory rather than a craftsman’s workshop, it weighs a little bit more but it cost an awful lot less, so I’m far less concerned about sticking it on my head while I roll about on a damp forest floor. You just know she’s saying, “take the hat off, take it off now”. 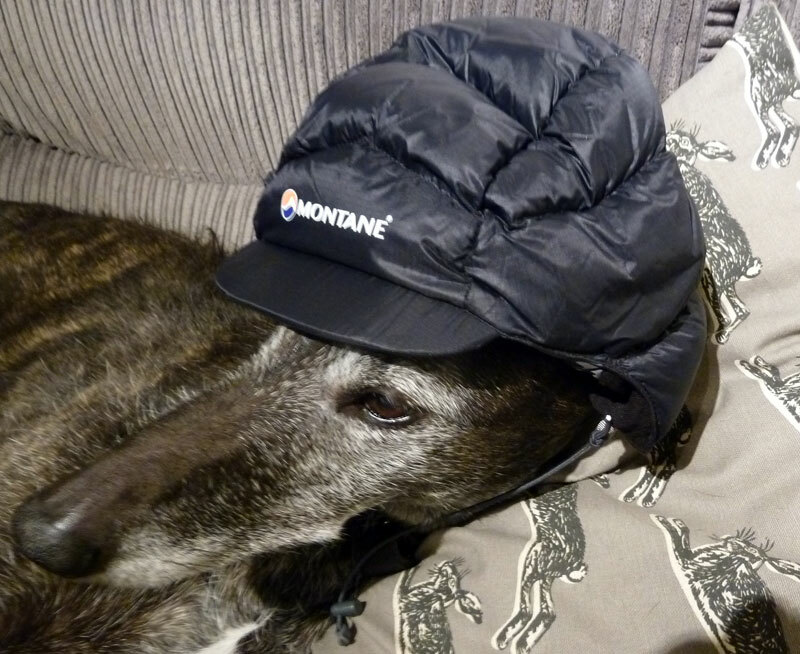 In my opinion, the Montane Plume makes a fantastic adornment to the head of the potentially cold bikepacker. It contains 18g of 650fp HyperDRY down, that might not sound like much but trust me, it’s more than enough for a hat. Unlike the majority of insulating head wear, the Plume is a cap rather than the more common beanie style. While in the minds of some, a cap might not score quite so highly in the style stakes, I’ve found it to be much more practical. Firstly, the cap extends lower at the back and sides which results in more warmth and cosy ears. The stiff peak is a bonus and ideal for helping keep any midge netting off your face. Another nice touch which adds to the practicality especially when sleeping, is the removable elasticated strap … it’s a simple thing but obviously makes a massive difference to keeping the thing secure and in place while you’re tucked up in your sleeping bag. The outer material is something called FREEFLOW – although confusingly, mine says Pertex Quantum on the outside. Either way, it’s lightweight and water resistant. The combination of water resistant down and outer, means a bit of light drizzle or condensation won’t turn your fluffy, puffy had into a clumpy mess. The claimed weight is 49g, the Bear Bones scales say 48g without the stuff sack but with the strap. That’s pretty impressive given the amount of warmth it provides. If you don’t want to use the supplied stuff sack, then the Plume will compress down to around the size of a satsuma, so finding it a happy home alongside your sleeping bag or whatever shouldn’t cause any issues. The Montane Plume – warm as toast, cheap as chips. Available in black, blue or red for £25 or a few pounds less with a little careful shopping. Read some recent research that puts the heat loss at 10%, maybe depends on the quality of your hair, if any? A mad scientist? I’ve been called many things but . . . . . ?